Several days ago I posted a recipe for Conchas (Mexican sweet bread rolls). 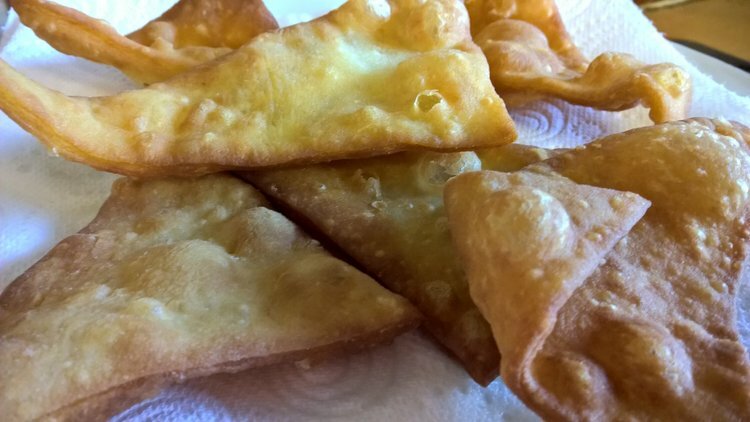 My blogging author friend Lorinda Taylor asked in the comments if I had ever made Sopapillas, and provided a recipe link. I hadn’t made them, or even ever tried them, but I have now! 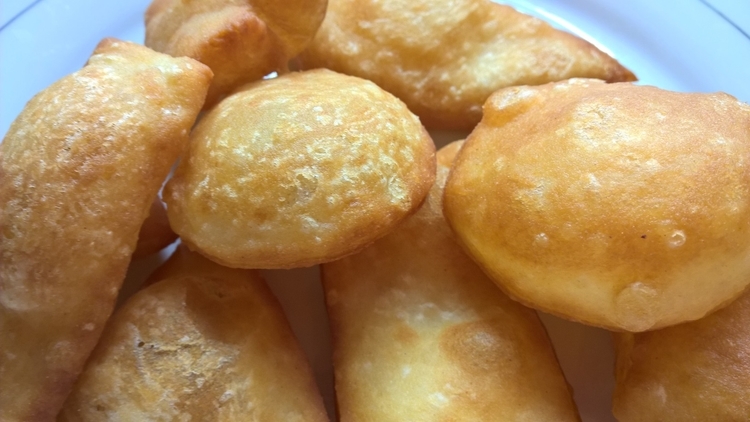 They are little quick bread/pastry type puffs, originating from New Mexico, that are fried and served warm, either sweet as a dessert, or with savoury fillings. Whilst the recipe itself is pretty simple, getting them to puff isn’t necessarily so. I would say only about a third of mine properly puffed up, but they still taste good flat, just not as much fun. The recipe that Lorinda gave me the link for was this one, so that’s the one I used. – 3 cups white flour, plus extra for kneading and rolling. – Oil for frying (the recipe said vegetable oil, I used light olive oil, not extra virgin as this isn’t good for frying). 1. Mix the flour, baking powder and salt in a bowl, then cut in the lard or shortening (or rub it in with your fingers). 2. Pour in the warm milk and bring it all together with a fork. You should end up with a pretty sticky dough. 3. 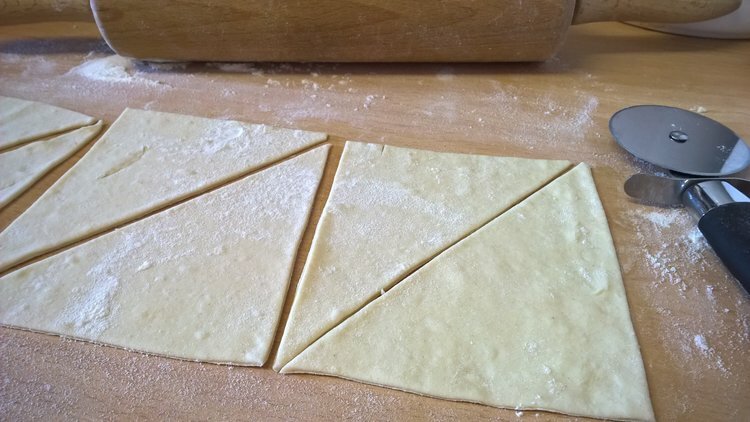 Tip the dough onto a well floured surface and knead it for a couple of minutes by repeatedly folding it in half and pushing down. Keep going until you have a nice soft dough that has lost its stickiness. 4. Cover with cling wrap and leave for about 15 minutes. 5. Divide the dough into four (original recipe said two, but I found it easier to roll out in smaller batches). Keep the other parts wrapped in cling film or it will dry out. Roll out thinly until it is about 1/8 inch thick. Be quite quick and light when you roll, don’t press down too hard, apparently they are more likely to puff up with a lighter rolling. Cut into triangles, a pizza cutter is ideal for this. Those cut triangles in the picture were my first ones and they were too big really, I had better luck with smaller ones, sides about 5-6cm. After triangles, I also made other shapes, some squares, and rectangles, and some circle ones using a 6cm cookie cutter. The circle ones worked best overall. It doesn’t work to gather and re-roll the scraps, but just cook the scraps as they are, they’re good to munch on too. 6. Heat up the oil, it needs to be at least 2 inches deep. Get it to a temperature of about 190C/380F. Don’t cook any more than two or three at a time, drop them in the hot oil, flip them over with a slotted spoon after 1-2 minutes to ensure a good golden colour on both sides and do another 1-2 minutes on the other side. Drain them on a few sheets of kitchen paper. If they come out like that, then just use them as dipping chips, or throw on a load of cinnamon and sugar, they’re crunchy and yummy, eat them warm. I really couldn’t work out why some puffed and some didn’t. I could have two identical shapes cut from the same rolling, put in the oil at the same time, and one puffs and the other doesn’t. One of the traditional ways to serve them if having them sweet is to tear off a corner, or create a small slit, and pour in some runny honey. We used caramel sauce instead. This quantity makes loads, you can store the left over ones in a tub in the fridge and reheat them for a few minutes in the oven when needed. Clearly these are pretty unhealthy, so I don’t plan on making them very often, but occasionally I will, if only because I want to see if I can master getting more of them to puff! Have you made these before? Did yours puff? That’s it you have to come right over and make these. On a climbing trip years ago in the middle of nowhere USA, well that’s not true it was Winslow Arizona made famous by the Eagles ‘standin on a corner in Winslow Arizona’. Anyway there was a little Mexican place that made sopapillas. They were heaven and we have never found them again in our travels. Not even in Mexico! Well these are from New Mexico rather than Mexico Mexico, so that would make sense that you had them in Arizona which is right next door…right? (*Doubts her geography and scuttles away to check map…) YES! Right next door. So anyway, you may have to go to New Mexico to get them again, or back to Arizona, or like you say, I could pop over and make them for you if that’s easier? I assume all expenses are covered? Good tip about New Mexico. We are headed to Arizona next month so I will be on the look out! You will wave your magic want and have me over in a puff of sopapilla! 🙂 (sorry). I haven’t made them nor have I tried them. But I’ll be on the lookout for them now. Yum. (puffed) and not evenly round but rather irregular in shape. Did you try honey on them? That’s what I remember. Yes, I realize most deep fried foods are not all that good for you, but an occasional indulgence can’t hurt! Shoot these digits have a mind of their own. Sorry about that, Vanessa. Where was my M.I.N.D.? What the heck didn’t I finish–senior moment@ Sorry. How would we know we’re not getting ripped off? Thanks Lorinda! – great idea!! There’s a restaurant here that drizzles them with honey, chocolate, and strawberry sauce and if you pay a little more…tops with ice cream! YUMMY!